A body found in the River Avon at Twerton on Monday 4 April has been confirmed as that of missing Bath Spa Creative Writing student James Bubear. 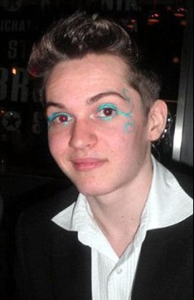 The 19-year-old had attended a fancy dress party in Bath’s Revolution bar on George Street on Sunday, March 13th. However, he never arrived home, with CCTV footage showing him spending 15 minutes sitting in a doorway where his passport and mobile phone were later found. The last confirmed sighting of him was on video footage shot just after 23:00 GMT that night. On April 4th, police from Avon and Somerset Constabulary confirmed that a body had been pulled from the river, but were unable at the time to formally identify it as James. Following a post-mortem examination, they have confirmed that it is that of Mr Bubear, and that there are no suspicious circumstances relating to his death. Bristol NUJ had been assisting James’s family and friends, and the students at Bath Spa who had appealed to us for help, in building a wide campaign which, it was hoped, would result in him coming home. Students at the University of the West of England published news of James’s disappearance in their newspaper and around 400 students in Bath marched through the town giving out leaflets and mustering support for the campaign. There was wide coverage in local and regional papers and broadcast media, with many taking a personal interest in the story. MPs from James’s home town of Llandrindod Wells and from Bath called for his return, and Bath Rugby Club and Bath Abbey lent their support. Over 16,000 people on Facebook joined his pages, with many individuals taking an active role in campaigning, and the family put up a detailed website. The news of the discovery of a body on 4 April resulted in hundreds of condolences pouring in over the social networks, as friends and well-wishers expressed shock and dismay. They now hope for a campaign to improve safety arrangements for students walking home in the dark to their riverside accommodation through the city. “We would like to thank James’s fellow students and the people of Bath for taking him as one of their own, and for the support they have given us in these last few difficult weeks. Avon Fire and Rescue have said the number of deaths and incidents in the river is “causing them concern”. Marion Flagg, the mother of student Casper Flagg whose body was also found in the River Avon on Boxing Day in 2009, said she believed there were dangerous areas. Bath and North East Somerset Council and and Avon and Somerset Police have commissioned an independent report into what safety improvements could be made along the river. Bristol NUJ extends its condolences and sympathy to the family and friends of James at this sad time. Can I just say THANK YOU for everything you (Christina Zaba) have done to help raise awareness over James’ disapperance. You have been incredibly supportive at a time when a lot of us did not know which way to turn. I personally will never forget your kindness. James was, as you know, a very close friend of mine but we can now find closure. You have helped in more ways than anyone could imagine. Just having your words of guidance has helped me so much. I hope that from this river safety in Bath is looked into, nightclubs responsibilities in allowing people to get drunk then forgetting them is looked into and journalists’ responsibilities in helping, supporting and publishing stories that really matter to the public, are looked into and I hope to see you at the memorial service early next week, along with anyone who feels they would like to offer their thoughts. Thank you Christina, you go above and beyond what is asked of you and for that I will forever remember you. Without Christina and the NUJ’s support we couldn’t achieved such fantastic amounts of awareness. I feel reassured that something good will eventually come out of this situation, and hopefully no other student will be waylaid on their way home. Your help meant so very much.